Curiously, the dying stars responsible for the most violent supernovae have never been found. And this is not due to any lack of effort — every time a supernova is observed, the imagery captured before the event for that location is reviewed, and yet neither the white dwarfs nor the red giants thought to be involved have ever been located. The closest thing to an SN Ia progenitor ever identified was the circumstellar matter found around SN PTF 11kx.4 But they didn't find a white dwarf or a red giant in the previous imagery — they found ejecta in the current imagery that were consistent with a previous Type II supernova, which the standard model attributes to the gravitational collapse of dying stars. So the SN progenitors were inferred, not observed. In the interest of a thorough treatment of the topic, somewhere in here we have to consider the possibility that the absence of evidence of pre-existing stars is actually evidence that there weren't any — maybe supernovae are not the deaths of old stars, but rather, the births of new ones, while Type Ia supernovae are simply star formation processes that were a bit too energetic, and all of the matter got dispersed. Figure 1. 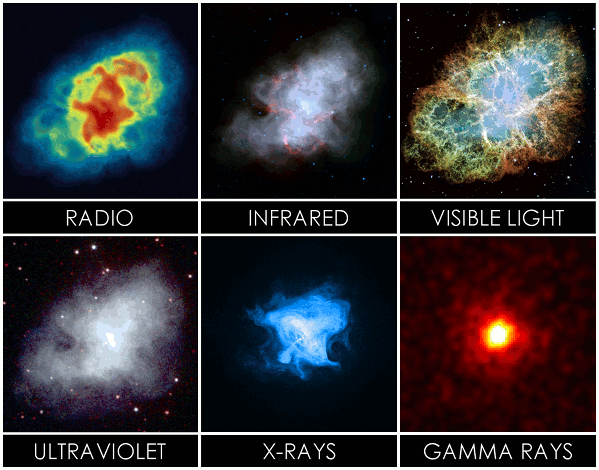 The Crab Nebula in various wavelengths, courtesy (radio) M. Bietenholz, J. M. Uson, T. J. Cornwell, (infrared) R. Gehrz, (visible) J. Hester, A. Loll, (ultraviolet) E. Hoversten, (x-ray) F. Seward et al., and (gamma) R. Buehler. To pursue this, we should start with examples. The most famous supernova remnant is the Crab Nebula. (See Figure 1.) The precipitating event was witnessed in 1054 ce , and with modern telescopes we can clearly see the nebular ejecta, as well as the "degenerate" star in the center. In the x-ray band, the toroidal structure of the pulsar is clearly visible, as are the bipolar jets, while the gamma rays are clear evidence of nuclear fusion inside the pulsar. All of these are inherent properties of the "natural tokamak" (NT) model (as described in the Tokamaks section), so the present treatment of supernovae will be an extension of that model. The initial star formation process, as depicted in panels 3~6 of Figure 2, will produce a brilliant display of EM radiation, and if it runs full course, it will leave behind a stellar remnant, in the form of an NT. This means that star formation, without a progenitor except for an imploding dusty plasma, might have all of the qualifications necessary to be identified as a supernova, at least by the EM radiation, if not by the presence of any sort of nebular remnant. If the implosion resolves into an NT, the powerful EM radiation will persist, and the light curve will resemble the pattern of a Type II-P supernova. Then again, if the implosion simply creates a binary system of main sequence stars, the light curve will be more like a Type II-L. 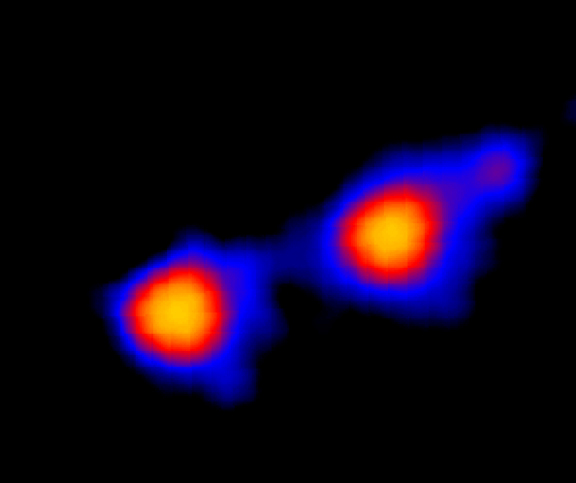 Both of these show the presence of hydrogen, which we'd expect in matter that was condensing for the first time out of a primordial giant molecular cloud. So these supernovae are star formation processes. In the case of SN PTF 11kx, how could a Type Ia supernova occur within the debris field of a previous Type II supernova? Intuition would prefer that the previous supernova, even if it was of the weaker variety, would evacuate the material in the vicinity, weakening the central star, if not annihilating it, and thereby reducing the chance of another supernova, much less an even more powerful one. In other words, the ejection of matter in a supernova should reduce the chance of the gravitational collapse of the progenitor, and preclude the kind of feeding frenzy that can result in a runaway thermonuclear explosion. The section on the Egg Nebula identified one easy way for a secondary supernova to happen. In Figure 3 we can clearly see radial ejecta. Whatever produced those ejecta would also have released copious amounts of EM radiation, and thus the event might have qualified as an SN II. In the present model, this would have been the initial collision of the strands in the filament (as in panel 3 of Figure 2). The tokamak is still in the process of forming (as in panel 5 of Figure 2), but if it gets too energetic, a runaway thermonuclear explosion might occur. If so, it will be a SN Ia, within the debris field of a previous SN II. Aside from a two-stage explosion within the same star formation process, there might be another way for a secondary supernova to occur. The Accretion section identified supernovae as the best triggers for new star formation, with gas cloud collisions as the second best. The essential ingredient in both cases is the shearing of Debye sheaths off of their dust grains, creating electrostatic attractions between all of the dust grains and all of the sheaths, which taken together constitute an inward body force. Gas cloud collisions typically have combined velocities of 20 km/s, while supernova ejecta can move much faster. The radial ejecta just from the initial collision of the Egg Nebula (see Figure 3) are expanding at 20 km/s,5:L164 making them candidates for triggering the collapse of nearby dusty plasmas. All the more interesting is that the Filaments section showed how the body force that motivates the collapse will be parallel to the motion of the particles, and in the case of radial ejecta from a supernova, the body force will point back to the locus of the supernova. So if there is enough matter in the immediate vicinity of the explosion, it might trigger a new round of star formation directly on top of itself. This might involve more energy than the tokamak can handle, in which case a runaway thermonuclear explosion in an SN Ia will obliterate the central star. If not, an SN Ib, IIb, or IIc will occur, sporting more heavy elements and less hydrogen, due to the fusion that has already occurred in the previous SN II at that location. If we build recurrence into our model of supernovae, it's easy to see how the elemental abundances will evolve with time, since each event fuses more heavy elements. The standard SN classification scheme pretty much goes from the most violent explosions, to the tamest. But it would be useful to see the scheme re-sorted on the basis of the evolution of the central star. Perhaps there will never be anything after a Type Ia supernova, if it obliterates the central star. Rather, the ejecta from an SN Ia will project outward in space, perhaps triggering the collapse of dusty plasmas elsewhere. Then comes the question of why Type Ia supernovae are reasonably accurate standard candles. It's possible that the nebula surrounding an NT implodes repeatedly, each time gaining strength, until eventually, it does so with sufficient force to disrupt the tokamak. So the SN Ia is the first event above that threshold. Then, if the tokamaks are roughly the same size, the energy released is the same. There is reason to believe that the mass of stars when they are first formed is relatively consistent, with most stars beginning at roughly 1/3 the mass of the Sun.6,7,8,9 Whether or not the reliability of the standard candle varies directly with the distribution within the initial mass function remains to be determined. Another interesting characteristic of the Crab Pulsar is that it is moving at 375 km/s relative to the surrounding nebula.10 This is fairly common for pulsars, quasars, and white dwarfs,11 which the present model considers to be closely related. But thus far, no reason for relative motion has been given. Figure 4 describes geometry that is completely symmetrical, mirrored on the plane of rotation, which is important in accounting for the uncanny symmetry in planetary nebulae, where the ejecta and the central star are clearly moving together. So under what conditions would they not move together (as in the Crab Nebula)? On second glance, we find that not all of the aspects of the NT model are actually mirrored on the plane of rotation. Where the strongest magnetic field lines of the tokamak close locally (labelled "toroidal plasmoid magnetic field" in Figure 4), the field is running counter to the galactic field. The opposing magnetic fields will produce a directional force, for the same reason that a bar magnet inside a solenoid moves in a specific direction when a current is supplied to the coils. Thus the NT, among other things, is a magnetic thruster. So why would the ejecta in a planetary nebula move with the central star, while the ejecta from a supernova stay where they are, and the star moves relative to them? The difference lies in when the matter was ejected. Any matter expelled during the initial implosion of the filament (as in panels 3~5 of Figure 2, and as in the radial ejecta in Figure 3) will project radially outward from the locus of the event. But if a tokamak gets established, and if it develops thrust, it will move relative to those ejecta. If it starts emitting bipolar jets, the jets will move with the tokamak, having been produced by it after it was already moving. Next we should directly address the most fundamental difference between the standard model of supernovae, versus the NT model. The standard model requires a binary system, because a progenitor has to feed on a new source of material that appeared all of a sudden, suggesting a binary companion that consolidated a bunch of material, and then gave it up. So a bloating red giant loses its envelope to a nearby white dwarf, resulting in a supernova. The present model has a built-in explanation for the evolution of binary companions, if the process stops at panel 3 of Figure 2. But if it does, both of the companions will be main sequence stars, and neither will have the angular momentum to become a white dwarf. If the process runs full course, and forms a tokamak, it will only form one star, because all of the strands of the imploding filament have to participate to get to panel 6 of Figure 2. So in no sense are the binary companions allowed by the present model compatible with the standard model's requirements for a red giant and a white dwarf to participate in a supernova. Figure 5. Mira in ultraviolet light, courtesy Hubble. Figure 6. Toroidal plasmoid, courtesy the National Spherical Torus Experiment. The difference here starts out sounding like just a matter of the prerogative of the modelers, who can choose whatever mechanisms — or however many stars — are necessary to explain the phenomena. But we do have some data that can be used to test the models. There is one binary system that is close enough to us that both members can be resolved in the imagery, and interestingly, the combined spectrum is consistent with the standard model's combination of a red giant and a white dwarf. The system is known as Mira, with an estimated distance of 300 ly from Earth. (See Figure 5.) The standard model considers the one at the upper right to be the red giant, with the white dwarf at the lower left.12 Their distance from the center of gravity is roughly the same as the orbit of Pluto around the Sun. But it's odd that they emit such similar UV radiation, considering the radical differences in the supposed natures of red giants and white dwarfs. The white dwarf, with its extremely high temperature, and non-existent atmosphere, should be excellent at producing UV radiation, while the relatively cool red giant, with its very large atmosphere, should absorb whatever UV radiation gets produced in its core. In the present model, these two blobs are just part of one toroidal plasmoid, which looks like a sectional view after all of the post-processing to drop out the background clutter. In other words, the brightest aspect of a luminous toroid is on the tangent. (See Figure 6.) 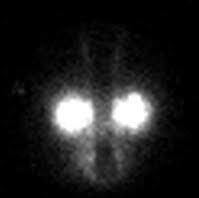 So it's no surprise that both blobs are so similar — it would be a surprise if they weren't. And the fact that the combined radiation of Mira has both the properties of a red giant and a white dwarf might just be evidence of the inability of the standard model to explain such radiation coming from a single structure. Like the Crab Pulsar, Mira also has an anomalous motion through its surroundings, though its velocity of 130 km/s isn't as dramatic. What's unique about Mira is that it is leaving a cometary tail in its wake, and it even creates a noticeable bow shock. (See Figure 7.) These features only appear in UV radiation, meaning that it isn't condensation that we're seeing — it's electron uptake in ionized matter. The Meteoric Airbursts section demonstrates how a hypersonic projectile can ionize matter in its bow shock, and neutralization can take a long time to occur. But such is outside of the scope of the standard model, along with the reason for the relative motion in the first place, much less how the accelerating force acted equally on both the red giant and the white dwarf, such that they would remain bound together. In the present model, it's just one star, with one of its features being a magnetic thruster. Figure 7. The tail of Mira in UV radiation, courtesy NASA. Figure 8. 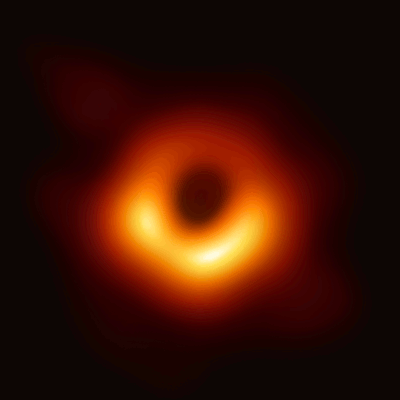 Supposed black hole at the center of M87, courtesy Event Horizon Telescope. So if the present model is correct, we get another tid-bit of information out of the Mira imagery — the annular radius in this case is similar to the orbit of Pluto around the Sun. If the recent study of M87 is correct,13 the estimated radius of the toroidal object in the center is roughly the same size. (See Figure 8.) Near the end of the Filaments section, it was stated that the toroidal plasmoid's radius will achieve an equilibrium, when the annular tensile force becomes equal to the centrifugal force of the high-velocity plasma, but it didn't stipulate where exactly that might be. We should suspect that the radius will be large, since the centrifugal force of relativistic velocities will be enormous at a tight radius. But this gives us a better idea of how large — it's a star that is as big around as our solar system, though it's a toroid instead of a sphere. SN 1987A is another interesting study. (See Figure 9.) The available imagery is not of sufficient resolution to determine the fine-grain structure of the rings, but the middle ring (violet~blue in Figure 9) shows radial filaments. Thus the ejecta from the supernova created filaments pointing back at the center of the explosion. But in this case, the filaments collapsed before they got all of the way back to the center, and the catastrophic Type Ia explosion was avoided. Also noteworthy are the two larger rings. The overall geometry is suggestive of the general structure of a planetary nebula, where the polar ejecta from the tokamak followed galactic magnetic field lines into a cylindrical form away from the central star (as described in the section on Tokamaks). The difference here is that it isn't a steady stream, so we're looking at episodic ejecta, from a previous supernova. The matter that condensed into the middle ring would then be the equatorial ejecta that were slowed by having to move perpendicular to the magnetic field lines. Once the particulate matter was sprayed into the interstellar medium during the original star-forming event, it then took a secondary supernova to organize filaments that would then collapse into the structures that we see. Finally, the ejecta from SN 1987A illuminated those structures. So it took at least three supernovae to create this visible structure. Repetitive supernovae are not uncommon, especially of the weaker varieties. One final note: classical novae are closely related to supernovae (just on a smaller scale), and get similar theoretical and taxonomic treatment in the mainstream literature.14,15 Likewise in the present model, novae occur for the same reasons, but the white dwarfs are called NTs, and the flare-ups are caused by the electrostatic collapse of radial filaments, instead of gravitational transfer from red giants. Repetitive novae are even more common than supernovae, perhaps because they are less likely to destroy the core structure.